Grabs you by the jugular into one helluva wild ride and wont let go till its final page. Delivering words in sentences with precision and control that set the scene, sometimes in rapid fire motion. Darker than dark, a world unto its own with characters and happenings that rise up from the pages and will fester in your mind with vivid and powerful images of a feast of grit, blood and sweat. 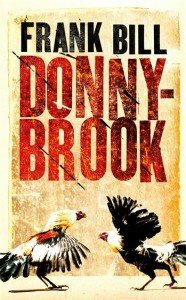 Frank Bill has won with the great characters and visceral storytelling that he has forged in this story Donnybrook. There is one tough man, Jarhead, who wants to do good for his family he’s fighting a dark fate that has passed and trying to change the tide of his future in earning a sum of dollars in a fight show unlike any other. This show down out in the middle of a heavily guarded fortress makes the fight in Fight Club seem like a kindergarten brawl due to the ungodly rules and players. There are badder guys than the Jarhead who have no rules and partake in all bad things under the sun just waiting to be taken out by many a enemy. Angus is one, a force to be reckoned with and then there an Asian guy Fu who is lethally trained in all the arts of taking an opponent out for the count. The author has laced all the characters and occurrences with spot on sparse, showing sentences, dialogue and a great usage of similes. A new fresh talent that leaves a trademark style in a literary form equivalent to way Tarantino leaves a trademark style in the film form with characters and scenes. The kind of story, I feel, that could be compared to the characters, story, dialogue and prose to the novels Savages by Don Winslow, A Feast of Snakes by Harry Crews, and Devil all The Time by Donald Ray Pollock. “Twenty fighter entered a fence-wire ring. Fought till one man was left standing. Hordes of onlookers-men and women who used drugs and booze, wagered and grilled food-watched the fighting. Two fights Friday. Four Saturday. The six winners fought Sunday for one hundred grand. The two jobs Jarhead worked, towing for a junkyard during the day, then flipping burgers and waffles two or three nights a week, hardly provided enough cash to feed and clothe his two smiling-eyed progeny. Boys created with the comeliest female in the Kentucky hills, Tammy Charles. In between his jobs he jogged through the Kentucky mining hills that gave his stepfather black lung and his mother gun-powder suicide. He pounded the homemade heavy bag that hung from a tree in front of his trailer till his hands burned red. Training for his next bare-knuckle payday out in an abandoned barn or tavern parking lot. Farmers. Miners. Loggers. Drunks. Wagering on another man’s will.